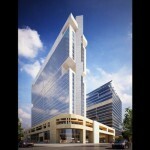 John Portman & Associates (JPA) is pleased to announce the grand opening of 615 South College in Uptown Charlotte. 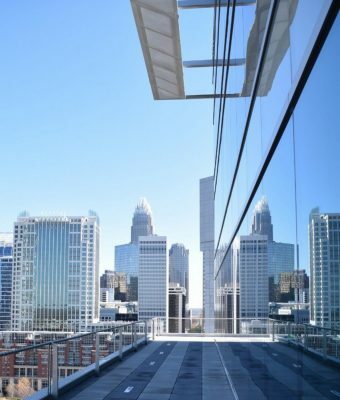 A celebration was held on Thursday, May 18 where Charlotte business leaders and commercial real estate professionals joined representatives of John Portman & Associates to commemorate the occasion. 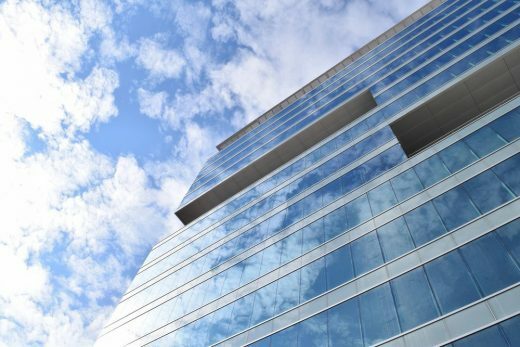 “Robust, bold, simple and green: 615 South College explores a new paradigm for officing. Cut terraces extend the open space of the city into the third dimension. 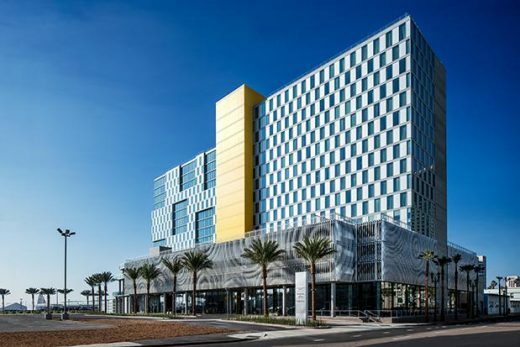 This powerful new building incorporates the technology, amenities and aesthetics in demand by next generation companies.” states John Portman & Associates design Principal Gordon Beckman, AIA. 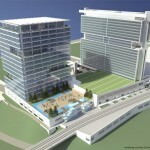 The August 14 event was no ordinary groundbreaking and not just because 615 South College is no ordinary office tower. 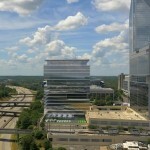 This new 370,000 sqft Class A office building for Atlanta-based Portman Holdings is set to cost $122 million. 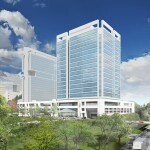 The 19-story tower is scheduled to be complete in February 2017. 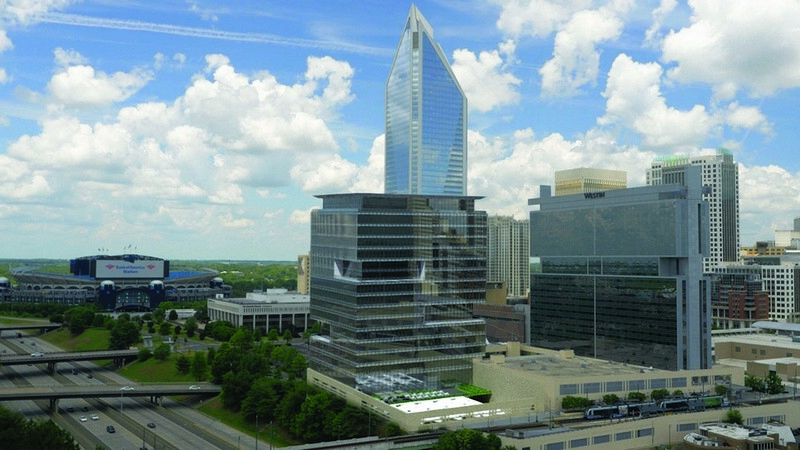 Since this new Class AA office tower is to be constructed atop the existing parking structure adjacent to The Westin Charlotte hotel, a crew of dignitaries such as North Carolina Governor Pat McCrory, as well as Portman representatives, wielded pickaxes to “Pop the Top” and begin construction. 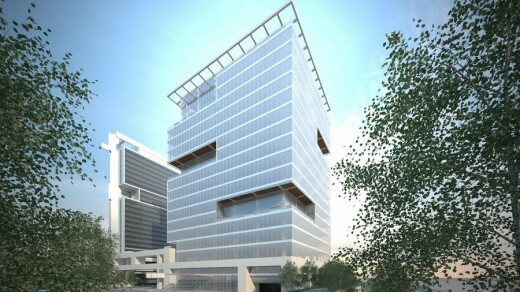 The 19-story, 370,000-square-foot office building, designed for LEED Gold certification, is scheduled to open in 2017. 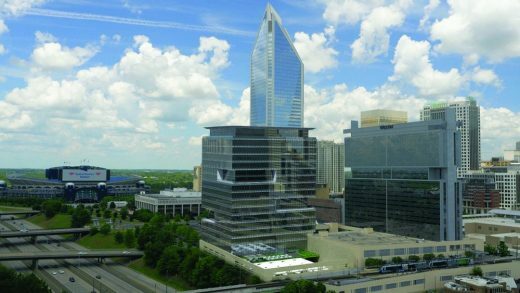 615 South College is a downtown Charlotte office tower to be completed in February 2017, next to Charlotte’s popular Westin Hotel. 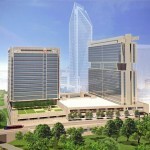 Designed by world-renowned John Portman & Associates and developed by Portman Holdings, the new 370,000 sq. 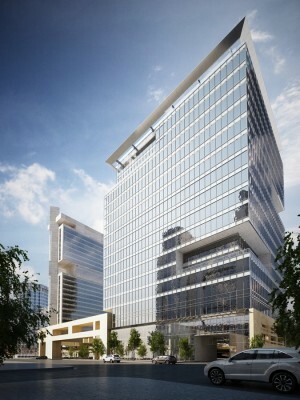 ft. Class A office building is aiming to achieve LEED Gold certification, and will incorporate unique features such as an elevated green plaza, two-story corner balconies, floor-to-ceiling windows, unmatched signage opportunities to I-277, fitness center with locker rooms and a conference facility. The first downtown stop of the LYNX Blue Line is located onsite, and the station’s platform offers direct connectivity to the Whole Foods scheduled to open in 2017. 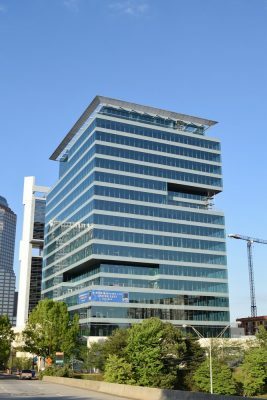 Stand out in Downtown Charlotte at 615 South College: with its unique Portman design, unbeatable location and high profile neighbors including Duke Energy, Ally Bank and Wells Fargo, this office tower is located on Charlotte’s front row. 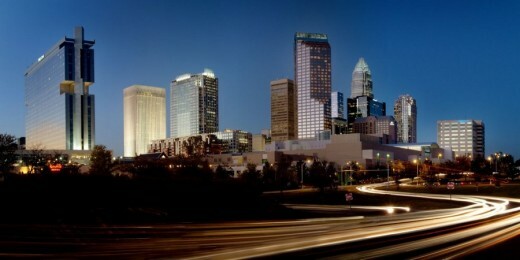 Next to the Westin, there are amazing views of the Charlotte skyline, and all the amenities that go with this location.